Sturdy industrial exploits of “Unseen Warfare”, Damaskin’s debut on Unknown Percept, created an impression of having another doom techno producer on board. 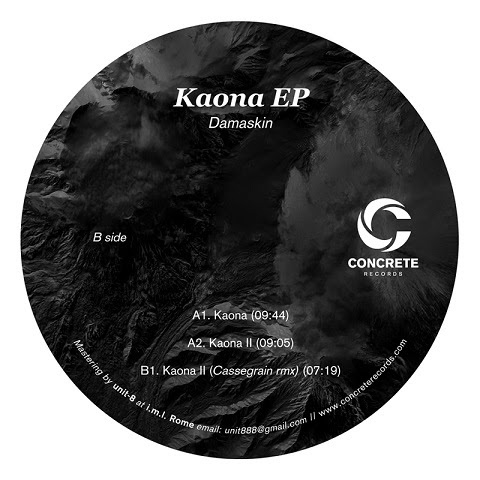 However, Damaskin’s new EP for Rome-based Concrete Records is of different breed is. On the label’s third vinyl release after Joe & Ubit and Voices From The Lake, the producer Ninoslav Ostojic plays safe with atmospheric acid-minded tunes. Hi-hats, 303 and background hum are for bulk trade nowadays and “Kaona” dissolves among similar efforts. Things turn better in “Kaona II”, at first instance based on irritating crunchy loop, which manages to adapt more complex textures during the course of the track. Intensity is not missing anymore when “Kaona II” is promoted to sweaty floors with the B-side’s remix by Cassegrain.